If you're like me, you've had advertising taglines shoveled into the recesses of your brain from a tender age. Not even a frontal lobotomy has allowed me to forget who I'm "in good hands with" or who "tries harder." If mass hypnosis through taglines works for the big boys, why not for the IP? "A tagline is even more important for the IP," says Brian Evans of the identity development firm Ashton Brand Group. "Many IPs use their own name as their business name. A tagline helps differentiate them and creates the opportunity to communicate their unique selling propositions." When my husband joined me on the Dark Side last year, we chose the name Twowriters.Net. And now that we're moving into a slightly less dank hovel, we need new letterhead. What better time to dream up the perfect tagline to adorn our marketing materials -- and impel prospects to fork over their loot? Here are some guidelines for developing a nifty tagline of your own. Okay, here's a news flash: a tagline can't be just a mélange of randomly chosen words with a good beat. It has to say something. Of course, my partner in crime and I wanted our Twowriters.Net tagline to signify that we're writers -- and damn good ones. But because we write everything from greeting cards (yes, I've actually sold sappy greeting card prose) to magazine articles to advertising copy, we wanted the tagline to encompass all kinds of writing. What makes the difference between a tagline that pervades the minds of consumers for years to come (Wendy's "Where's the Beef?") and one that makes people wonder whether your ad person was on smack (Lucky supermarket's "Lower Than Low")? A good tagline is memorable. Some good ways to create a tagline that sticks in the brain are with alliteration (Jaguar's "Don't Dream It. Drive It. "), rhymes (Timex's "It takes a licking and keeps on ticking. "), and puns (Minute Maid's "Squeeze the Day"). And keep it as short as possible. The tagline of IP editor Hilary Powers is "The edit you want, when you want it done." She says, "This [tagline] states the important bits and implies most of the rest, and it fits in one line on a standard business card in a reasonable size of type. There's an earlier, longer version that I'll use in directories if they allow the word count: 'The edit you want, when you want it done: online, on time, and on target.'" A good tagline includes your unique selling proposition. What do you do? Why should anyone besides your mother care? Tell them in the tagline -- especially if your business name doesn't make it clear what you do. A good tagline differentiates your brand. Okay, we know what you do and why we should care. But how are you different from the hordes of other IPs begging for the prospect's business? Maybe you specialize in a certain type of graphic design or offer the fastest service this side of the Mississippi. A good tagline imparts positive feelings for the brand. This rules out "Twowriters.Net: We're Not as Bad as You Think." Some IPs never have to suffer through a mind-numbing brainstorming session to find a great tagline. Judith Lederman, for example, was struck with divine inspiration when she thought up "If you're the expert, shouldn't everybody know?" for her business, JSL Publicity & Marketing. "This one came to me in one of my creative 'bursts' and I knew it was the right slogan from the moment it popped into my head," she says. First came the joke taglines: "Twowriters.Net: Words for Nerds." "Twowriters.Net: For People Who Can't Read." "Twowriters.Net: Because It Takes the Both of Us to Get Your Job Done." "Twowriters.Net: A Most Composing Couple" was submitted by my own dad, Anthony "Little Tony" Formichelli. Foster dismissed this tagline as a bit too reminiscent of Sonny and Cher. He's now in the hospital, recuperating from two broken kneecaps. Newspaper reporter Juliet Pennington suggested "Twowriters.Net: Our Prose. Your Profit." "Is that something a client will identify with?" asked Evans. "Our brochure, for example, is a key driver for our profits. But there's a lot that has to happen between the actual copywriting and us making a profit." Book author and magazine writer Lise Pyles contributed "Twowriters.Net: On Deadline or We'll Eat a Bug." "It's funny. But if I were hiring a writer, I would expect them to be on deadline," said Evans. "It's not a key differentiator." 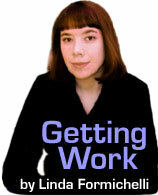 Magazine writer Monique Cuvelier came up with "Twowriters.Net: Writing That Gets Results." "Too apple pie," sneered Foster from his hospital bed. Cuvelier also thought up "Twowriters.Net: Compelling Content." Bingo. "It's short and concise, and it sends a very clear message," said Evans. "It also leaves the door open for all kinds of writing. If I were looking for someone to write copy for me, compelling content is what I'd be looking for." "Neato," Foster added. Follow these guidelines, and soon your identity will be wedged firmly into your prospects' brains -- right between "Don't leave home without it" and "The Other White Meat."